It is clear that the peace should not be purchased at any price. But the illusion that it can be free is ridiculous. We need […] peace without impunity. I understand that in the balance between peace and justice, this balance needs some sacrifice on the part of justice, but we cannot accept impunity. Indeed, Colombia's ongoing peace talks with the Marxist guerrillas were facilitated by a package of transitional justice instruments written into the Colombian constitution through the adoption of the Legal Framework for Peace (See Appendix 2) in July 2012. By creating the space for Santos' peacemaking efforts while also preventing impunity for conflict-related crimes and providing guarantees to victims,5 the Framework is an innovative effort to make transitional jurisprudence and conflict resolution complementary rather than competitive ventures. The effort is not without its critics. This development departs from the original understanding of transitional justice as addressing past abuses rather than still-ongoing abuses.6 While some scholars and practitioners applaud this "era of complementarity"7 between transitional justice and peacemaking, others remain skeptical about the "overly-ambitious aim" of "justice-seeking in the absence of peace. "8 In Colombia, former President Álvaro Uribe is among the loudest detractors of the process, arguing that his country needs "peace without impunity. "9 While not the most credible objector, his words echo the concern that the simultaneous use of transitional justice and peacemaking heightens the tension between the demands of peace and those of justice. There are reasons to remain optimistic about the Colombian experiment, however. Despite its imperfections, the framework that undergirds the ongoing Colombian negotiations places transitional justice at the heart of this peacemaking effort. The negotiation program itself novelly considers victims' rights, however briefly and vaguely. In addition, the process incorporates Congress and constituents in the ratification and implementation of the peace agreement, including transitional justice measures emerging from the process. Any deal will also face the scrutiny of national, regional, and international courts. These facts suggest that both the Colombian government and the FARC must look beyond their narrow interests to broker a peace agreement that can minimally satisfy both local and global expectations of justice. Through an investigation of transitional justice efforts in Colombia, I argue that the use of transitional justice instruments in ongoing conflict is not only possible, but that a wise use of such instruments can even facilitate bringing an end to conflict itself. This paper explores the potential complementarity of peacemaking and transitional justice instruments in the midst of ongoing conflict as well as the challenges that such an enterprise creates. I first discuss the opportunities and challenges presented by the rise in the use of transitional justice during ongoing conflict and the growing aspirational and operational overlaps between the transitional justice and peacemaking fields. I then contextualize the current transitional justice and conflict resolution architecture, tracking Colombia's first steps—and missteps—in its controversial use of transitional justice. I go on to analyze the Legal Framework for Peace: the novel instrument that enabled the ongoing peace process by writing transitional justice instruments into the Constitution. Here, I also consider the development of the negotiations with the FARC in light of the embedment of transitional justice in Colombia's conflict resolution labors. Finally, I analyze the opportunities and challenges faced by Colombia's complementary formula—and its implications for our understanding of the nature and purpose of transitional jurisprudence. At the negotiating table, harmonizing the positions of parties engaged in intrastate conflict is a monumental undertaking. Even finding the lowest common denominator of the belligerents' interests that is preferable to warfare is no easy task.10 Moreover, in the wake of the rise of the "global accountability regime," such a lowest-common-denominator agreement may be insufficient to earn global legitimacy or even uncontested legality.11 Under current international law and prevalent worldwide-responsibility norms, peace between warring parties can no longer be bartered at the cost of justice for the victims to the conflict. Transitional justice refers to the judicial and non-judicial mechanisms implemented by different countries in the wake of conflict in order to overcome a violent past and redress the legacy of large-scale human rights violations. Just as the ambitions of conflict resolution have increased in the recent past, transitional justice has also evolved to share some of the goals and operational timelines of peacemaking. This is in part due to the intractability of contemporary conflict, which blurs the boundaries between war and peace. Transitional justice policies are used in situations where transition is uncertain, fragile, or even unapparent.14 The expanded legal architecture around human rights violations is another factor: an ever-more-ambitious international human rights agenda has labored to broaden the notion of threats to collective peace and security to include a concern for "human security." The international human rights enterprise has succeeded, for example, recognizing the emerging principle of the "responsibility to protect," and—most crucially for transitional justice as a field—in creating the International Criminal Court (ICC).15 The widespread ratification of the Rome Statute that established the ICC signals that accountability for genocide, war crimes, and crimes against humanity is no longer purely a matter of local prerogative. Finally, the emergence of a "victim-centered" approach to justice has also contributed to the evolving normative ambitions of transitional jurisprudence. Transitional justice now aims to frame peacemaking efforts and delineate "the politics of transition within certain legal standards, particularly those regarding victims' rights to truth, justice, and reparations. "16 Further, transitional justice has been increasingly recast as a means to bring about—or at least support—a transition in the first place. The ICC somewhat relies on the notion that its involvement during conflict deters future violence,17 even without clear empirical evidence for such a consequentialist argument.18 Nevertheless, those who support transitional jurisprudence going beyond prosecutions and punishment have suggested creative and feasible ways in which transitional justice and peacemaking can work in productive tandem. Moreover, pursuing ‘transformative' rather than merely ‘restitutive' transitional justice may be particularly appropriate under the auspices of peacemaking and in the context of a transition in the making. In other words, it might be worth pursuing transitional justice strategies that seek to improve upon the status quo prior to the conflict rather than to merely restore the country to such a state. This might be especially true in a transition from a "conflicted democracy": A political system that meets the minimum formal requirements of procedural democracy, but faces such entrenched polarization and divisions that it is either subjected to, or perpetually threatened by, violent conflict.25 Rosario Figari applies this concept to the Colombian state and Rodrigo Uprimny suggests a similar understanding when describing the country as a "dangerous democracy in danger. "26 A conflicted democracy such as Colombia's has the need to distance itself from a political legacy of long-standing exclusion—to the particular injury of the rural poor—and active violations of human rights and international humanitarian law. A break with such illegitimate order is at the heart of a conflicted democracy's transition to a state of peace and substantive liberal democracy.27 Colombia's new transitional justice framework must prove itself more efficacious and politically transparent than the Uribe administration's agenda to demobilize the pro-systemic paramilitaries. Finally, transitional justice discourse empowers victims as relevant political agents and elevates their rights in the list of priorities of a society emerging from conflict. Even though the victims' rights agenda appears to be especially vulnerable to manipulation during ongoing conflict, the Colombian experience surrounding Uribe's Justice and Peace Law shows how human rights advocates and victims' groups can at least partially re-appropriate the discourse of transitional justice to make non-trivial gains.33 Indeed, victims' rights are now firmly at the center of the peace process between the Colombian government and the FARC, which hints at a positive transformation of the power dynamics between victims and perpetrators. Maria Alexandra van Nievelt is a Chilean student pursuing a Master's degree in International Affairs with a concentration in international security policy. Alex's research focuses on civil war violence and comparative peace processes in Latin America. I am grateful to Professor Graeme Simpson for his guidance and feedback as I delved into this project. I also want to thank Elisabeth Wood, Francisco Gutiérrez Sanín, Ana Arjona, Roxane Cassehgari, and Juan Pablo Toro for sharing their expertise on the Colombian conflict. See the Glossary in Appendix 1 for the expansion of this and every important acronym hereafter. Juan Manuel Santos, "Statement by the President of the Republic of Colombia," Address before the General Assembly of the United Nations in its 68th Session, (New York: 24 September, 2013). Felipe Gómez Isa, "Justice, Truth and Reparation in the Colombian Peace Process," Norwegian Peacebuilding Resource Center (2013), http://peacebuilding.no/var/ezflow_site/storage/original/application/5e7c839d7cf77846086b6065c72d13c5.pdf. Rosario Figari Layús, The Role of Transitional Justice in the Midst of Ongoing Armed Conflict: The Case of Colombia, (Potsdam, Germany: Universitätsverlag Potsdam, 2010), 31. Graeme Simpson, "Transitional Justice and Peace Negotiations," International Center for Transitional Justice (discussion paper, 2008), 21. Catalina Díaz, "Colombia's Bid for Justice and Peace," Building a Future on Peace and Justice," Workshop 5 at the Building a Future on Peace and Justice Conference, (Nuremberg, Germany: June 25-27, 2007), 7, citing Ruth Teitel, "Law and Politics of Contemporary Transitional Justice," Cornell International Law Journal 38 (2005): 838-862. Álvaro Uribe Vélez, interview with the author, Yale University Podcast Video, November 7, 2012. Although quantitative analyses regarding the success rate of civil war mediation efforts are fraught with problematic claims regarding, among others, the definitions of an intrastate conflict and a mediation success, a generous analysis of 438 diplomatic interventions in 68 conflicts between 1945 and 1999 concluded that only 38% of mediations achieved full or partial settlement, although around 57% resulted in at least a temporary ceasefire. See Patrick Regan, Richard W. Frank and Aysegul Aydin, "Diplomatic Interventions and Civil War: A New Dataset," Journal of Peace Research 46:1 (2009): 135-46. Par Engstrom, "Transitional Justice and Ongoing Conflict," in Transitional Justice and Peacebuilding on the Ground: Victims and Ex-Combatants, ed. Chandra Lekha Sriram, et al. (London: Routledge, 2013), 41. Engstrom, "Transitional Justice and Ongoing Conflict," 46. Simpson, "Transitional Justice and Peace Negotiations," 7; Richard Ponzio, Democratic Peacebuilding: Aiding Afghanistan and other Fragile States (Oxford: Oxford University Press, 2011). Engstrom, "Transitional Justice and Ongoing Conflict," 43-44. Engstrom, "Transitional Justice and Ongoing Conflict," 44. María Paula Saffon and Rodrigro Uprimny, "Uses and Abuses of Transitional Justice in Colombia," Reprinted in Law and Peace Negotiations, ed. Morten Bergsmo and Pablo Kalmanovitz, Forum for International Criminal and Humanitarian Law (FICHL) Publication Series 5 (2007; Reprinted in 2009): 217-245, https://www.fichl.org/fileadmin/fichl/documents/Pre-TOAEP/090325_FICHL_5__law_in_peace_negotiations_.pdf. ICC Prosecutor Luis Moreno Ocampo has repeatedly argued that his office prevents and deters future violence, and has cited Cote d'Ivoire as evidence (see Luis Moreno Ocampo, "Building a Future on Peace and Justice," Keynote Address at the Building a Future on Peace and Justice Conference, [Nuremberg, Germany: June 2007], 25-27). He also has more generally stated that the ICC seeks to "reshape the norms of human conduct while violence is still ongoing, thus aiming, as stated in the Rome Statute, to contribute to the prevention of future crimes" (Moreno Ocampo, "Transitional Justice in Ongoing Conflicts," International Journal of Transitional Justice 1 (2007): 8-9, doi:10.1093/ijtj/ijm014). Practically speaking, the temporal jurisdiction of the ICC, which limits prosecutions to violations occurring after July 1, 2002, is a big part of why the court engages with ongoing conflict. Oskar N. T. Thoms, James Ron and Roland Paris, "State-level Effects of Transitional Justice: What Do We Know," International Journal of Transitional Justice (2010): 1-26; Oskar N. T. Thoms, James Ron and Roland Paris, "The Effects of Transitional Justice Mechanisms: A Summary of Empirical Research Findings and Implications for Analysts and Practitioners," Centre for International Policy Studies Working Paper (April, 2008). Saffon and Uprimny, "Uses and Abuses of Transitional Justice in Colombia," 235. Simpson, "Transitional Justice and Peace Negotiations," 7. Colm Campbell and Fionnuala Ni Aolain, "The Paradox of Transition in Conflicted Democracies," Human Rights Quarterly 27 (2005): 175. Figari Layús, Transitional Justice, 18-47; Rodrigo Uprimny Yepes, "Transitional Justice Without Transition? Possible Lessons From the Use and (Misuse) of Transitional Justice Discourse in Colombia," Paper presented at the Building a Future on Peace and Justice Conference, (Nuremberg, Germany: June 25-27, 2007), http://www.peace-justice-conference.info/download/ws 5 - expert paper - uprimny.pdf. Figari Layús, Transitional Justice, 24-5, 30. María Paula Saffon and Rodrigo Uprimny, Plan Nacional de Desarrollo y Reparaciones. 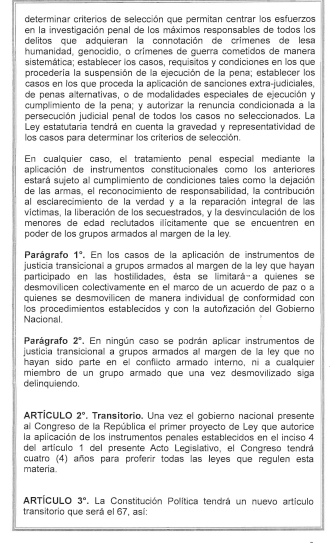 Propuesta de un programa nacional masivo de reparaciones administrativas para las víctimas de crímenes atroces en el marco del conflicto armado, (Bogotá, Colombia: DejuSticia, 2007). Figari Layús, Transitional Justice, 29; Saffon and Uprimny, Plan Nacional de Desarrollo y Reparaciones. Saffon and Uprimny, Plan Nacional de Desarrollo y Reparaciones. Nelson Camilo Sánchez and Rodrigo Uprimny, "Transitional Justice Without Transition? The Colombian Experience in the Implementation of Transition Measures," in InterAmerican Institute of Human Rights, Contribution of Truth, Justice, and Reparation Policies to Latin American Democracies (San José: Inter-American Institute of Human Rights, 2011), 143. Saffon and Uprimny, "Uses and Abuses of Transitional Justice in Colombia," 236. Saffon and Uprimny, "Uses and Abuses of Transitional Justice in Colombia." Ruti Teitel, "Law and Politics of Contemporary Transitional Justice," Cornell International Law Journal 38 (2005): 838-862. Figari Layús, Transitional Justice, 31, citing Saffon and Uprimny, "Uses and Abuses of Transitional Justice in Colombia." Saffon and Uprimny, "Uses and Abuses of Transitional Justice in Colombia"; Engstrom, "Transitional Justice and Ongoing Conflict," 50, 53. Adriana Rincón Villegas, "Transitional Justice in Ongoing Conflicts: The Case of Colombia" (master's thesis, University of Georgia, 2015), 7. Jemima García-Godos, "Colombia: Accountability and DDR in the Pursuit of Peace?" in Transitional Justice and Peacebuilding on the Ground: Victims and Ex-Combatants, ed. Chandra Lekha Sriram et al. (New York: Routledge, 2013). Ana M. Arjona and Stathis Kalyvas, "Recruitment into Armed Groups in Colombia," in Understanding Collective Political Violence, ed. Yvan Guichaoua (Houndmills, Basingstoke: Palgrave Macmillan, 2012), 143-71. Marc Chernick, "Negotiating Peace amid Multiple Forms of Violence: The Protracted Search for a Settlement to the Armed Conflicts in Colombia," in Comparative Peace Processes in Latin America, ed. Cynthia Arnson (Washington, D.C.: Woodrow Wilson Center Press, 1999), 162. Nazih Richani, Systems of Violence: The Political Economy of War and Peace in Colombia, (Albany: State University of New York Press, 2002), 62-64. Paul Wolf, "ELN and University Violence 1965-1973," http://www.icdc.com/~paulwolf/colombia/universityviolence.htm#eln. García-Godos, "Colombia: Accountability and DDR in the Pursuit of Peace?" 221. Jeremy M. Weinstein, Inside Rebellion: The Politics of Insurgent Violence, (Cambridge: Cambridge University Press, 2007), 293; Juan Guillermo Ferro Medina and Graciela Uribe Ramón, El Orden de la Guerra, las FARC-EP: Entre la Organización y la Política (Bogotá: Centro editorial Javeriano, CEJA, 2002). Christopher Thornton and Rainer Gude, "Towards Peace in Colombia: The Economic Obstacles to a Colombian Peace Process," Peace & Conflict Review 5:2 (2011): 5. UCDP Conflict Encyclopedia. "Colombia," Uppsala University Department of Peace and Conflict Research. Carlos Medina, Autodefensas, Paramilitares y Narcotráfico en Colombia: Orígen, Desarrollo y Consolidación, (Bogotá: Editorial Documentos Periodísticos, 1990). Comisión Interamericana de Derechos Humanos (CIDH), "Violencia y la Violación del Derecho Internacional de los Derechos Humanos y el Derecho Internacional Humanitario," in Colombia Country Report 1999, Chapter 4, http://www.cidh.org/countryrep/Colom99sp/capitulo-4e.htm. Adriaan Alsema, "37 Colombian Congressmen, 5 Governors Convicted for Ties to Paramilitaries," Colombia Reports, (May 16, 2013); Sam Logan and Tatiana García, "Paramilitary Politics: A Colombian Reality," International Relations and Security Network (2006), http://www.isn.ethz.ch/isn/Digital-Library/Articles/Detail/?lng=en&id=108000. Stephanie Hanson, "Colombia's Right-Wing Paramilitaries and Splinter Groups," Council on Foreign Relations (CFR), (11 January, 2008), http://www.cfr.org/colombia/colombias-right-wingparamilitariessplinter-groups/p15239. Villegas, "Transitional Justice in Ongoing Conflicts: The Case of Colombia," 4. Sam Goffman, "Colombia: Paramilitaries Get Sweetheart Deal," NACLA Report on the Americas 39:2 (2005): 50-1. Saffon and Uprimny, "Uses and Abuses of Transitional Justice in Colombia," 223-24. Comisión Nacional de Reparación y Reconciliación (CNRR), "Disidentes, Rearmados y Emergentes: ¿Bandas Criminales o Tercera Generación Paramilitar?" (2007). Sally Palomino, "Las Bacrim tendrían unos seis mil hombres, en seis estructuras," La Semana (January 18, 2011). Jeremy McDermott, "Colombia's Criminal Bands Pose New Security Challenge," BBC News, (April 25, 2011). "Las bacrim cometen la mitad de los asesinatos en Colombia," Infobae (January 26, 2011). United Nations High Commissioner for Refugees (UNHCR), "Colombia: 2015 UNHCR country operations profile," (2005) http://www.unhcr.org/pages/49e492ad6.html. International Crisis Group (ICG), Transitional Justice and Colombia's Peace Talks, Latin America Report N°49, (August 29, 2013), ii. United Nations Office for the Coordination of Humanitatian Affairs (OCHA), "Fondo de Respuesta a Emergencias – Colombia," Informe Segundo Trimestre (2014), 1. Colombian Constitution of 1991, Art. 93. ICG, Transitional Justice and Colombia's Peace Talks, 6-7. The Set of Principles for the Protection and Promotion of Human Rights through Action to Combat Impunity was formulated by UN expert Louis Joinet in 1997, and updated by Diane Orentlicher in 2005; Gustavo Gallón, "Human Rights in Crisis: The Case of Colombia Lecture at the School of International Relations of the University of Saint Andrews," (November 14, 2013), http://www.coljuristas.org/documentos/adicionales/speech_st_andrews_2013-11-14.pdf. ICG, Transitional Justice and Colombia's Peace Talks, 7; Sánchez and Uprimny, "Transitional Justice Without Transition? The Colombian Experience in the Implementation of Transition Measures," 12-13. "Ley No. 975," Official Website of the Presidency of Colombia (July 25, 2005), http://wsp.presidencia.gov.co/. ICG, Transitional Justice and Colombia's Peace Talks, 4. Saffon and Uprimny, "Uses and Abuses of Transitional Justice in Colombia," 229. Nicole Summers, "Colombia's Victims' Law: Transitional Justice in a Time of Violent Conflict?" Harvard Human Rights Journal 25:1 (2012): 225. Because Uribe's government did not recognize the existence of an international armed conflict in Colombia, the national legislation from this period does not speak of violations of international humanitarian law, i.e. war crimes. Diana Esther Guzmán et al., "Colombia," Las Víctimas y la Justicia Transicional: ¿Están Cumpliendo los Estados Latinoamericanos con los Estándares Internacionales? (Washington, DC: Fundación para el Debido Proceso Legal, 2010), 109; Summers, "Colombia's Victims' Law: Transitional Justice in a Time of Violent Conflict?" 224. Díaz, "Colombia's Bid for Justice and Peace," Building a Future on Peace and Justice," 16. "Los intereses electorales de las Bacrim," La Semana (October 10, 2011). In the admittedly not unbiased words of Luciano Marín, aka Iván Márquez, one of the FARC's representatives in Havana; "Farc llama a Gobierno a eliminar trabas jurídicas para la paz," El Espectador (March 26, 2015). Uprimny, "Transitional Justice Without Transition? Possible Lessons From the Use and (Misuse) of Transitional Justice Discourse in Colombia," 4-5. "Informe de Gestión 2012-2013," Fiscalía General de la Nación, (March 2013). "Ley No. 1592," Official Website of the Presidency of Colombia (December 3, 2012), http://wsp.presidencia.gov.co/. A well-known example of the military's abuses is the "false positives" scandal, which revealed the practice—spurred on by perverse incentives stemming from rewarding high body counts—of murdering civilians to pass off them off as "combat killings." (See Adam Isacson, "Ending 50 Years of Conflict: The Challenges Ahead and the U.S. Role in Colombia," Washington Office on Latin America (2014): 8, http://www.wola.org/). "Ley No. 1448," Official Website of the Presidency of Colombia (December 3, 2011), http://wsp.presidencia.gov.co/. "Ley No. 1448," Official Website of the Presidency of Colombia, Art. 21 cf. United Nations Commission on Human Rights, "United Nations Basic Principles and Guidelines on the Right to a Remedy and Reparation for Victims of Gross Violations of International Human Rights Law and Serious Violations of International Humanitarian Law" (UNBPG), (2005), UN Doc E/ CN.4/RES/2005/35, I.2.c. Sánchez and Uprimny, "Transitional Justice Without Transition? The Colombian Experience in the Implementation of Transition Measures," 134. ICG, Transitional Justice and Colombia's Peace Talks, 37. Summers, "Colombia's Victims' Law: Transitional Justice in a Time of Violent Conflict?" 226. "Acto Legislativo No. 1," Official Website of the Presidency of Colombia (July 31, 2012), http://wsp.presidencia.gov.co/. All subsequent quotations are taken from the original text (see Appendix 2). All translations are my own. Felipe Gómez Isa, "Justice, Truth and Reparation in the Colombian Peace Process," 2. Nelson Camilo Sánchez and Rodrigo Uprimny Yepes, "El Marco Jurídico Para La Paz: ¿Cheque En Blanco O Camisa De Fuerza Para Las Negociaciones De Paz?" in Justicia Para La Paz: Crímenes Atroces, Derecho a La Justicia Y Paz Negociada, ed. Rodrigo Uprimny Yepes, Luz María Sánchez Duque and Nelson Camilo Sánchez León (Bogotá, Colombia: Centro de Estudios de Derecho, Justicia y Sociedad, Dejusticia, 2014), 184. Sánchez and Uprimny, "El Marco Jurídico Para La Paz,". Gómez Isa, "Justice, Truth and Reparation in the Colombian Peace Process," 2; Sánchez and Uprimny, "Transitional Justice Without Transition? The Colombian Experience in the Implementation of Transition Measures." Sánchez and Uprimny, "El Marco Jurídico Para La Paz." "Everyone Throwing Their Support Behind Colombia's Peace Process," Telesur (January 22, 2016), http://www.telesurtv.net/english/news/Everyone-Throwing-Their-Support-BehindColombias-Peace-Process-20160122-0020.html. It should be noted that the FARC has rejected the term "disarmament" arguing that the term does not apply, as it has not been defeated militarily. The peace process has chosen the language of dejación de armas ("leaving weapons behind") to refer to the FARC's voluntary disarmament and disbandment as a guerrilla group. This careful word choice follows that of the Northern Ireland peace process, which spoke of decommissioning rather than disarming combatants. United Nations High Commissioner for Human Rights. "Report of the United Nations High Commissioner for Human Rights on the Situation of Human Rights in Colombia," (2013), UN Doc A/HRC/22/17/Add.3, 18. Natalio Cosoy, "En qué consiste el pacto entre las FARC y el gobierno de Colombia que los deja a un paso de la paz," BBC. (September 24, 2015), http://www.bbc.com/mundo/noticias/2015/09/150923_colombia_farc_santos_acuerdo_paz_la_habana_ao. "9 Unanswered Questions About Colombia's Victims and Justice Accord," Washington Office on Latin America, (2015), http://colombiapeace.org/2015/12/23/9-unanswered-questions-aboutcolombiasvictims-and-justice-accord/. Guáqueta, "Political and Economic Dimensions of the Colombian Conflict," 3. Chernick, "Negotiating Peace amid Multiple Forms of Violence," 159-95. United Nations High Commissioner for Human Rights, UN Doc A/HRC/22/17/Add.3, 18. Villegas, "Transitional Justice in Ongoing Conflicts: The Case of Colombia," 7, quoting Eduardo Pizarro, "Reparando el bote en altamar," in Ley de Justicia y Paz (Bogotá, Colombia: Norma, 2009). AUC: Autodefensas Unidas de Colombia (United Self-Defense Forces of Colombia) is an umbrella organization of far-right paramilitary groups in Colombia, each intending to protect their local political, economic and social interests by fighting left-wing insurgent groups in their regions. While the AUC was officially demobilized in 2006, some local successors remain. Bacrim: Bandas criminales emergentes, criminal bands. 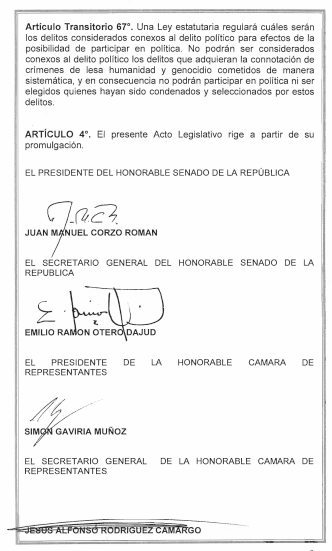 CNRR: Comisión Nacional de Reparación y Reconciliación was created under the 2005 Justice and Peace Law. The Commission, which operated for eight years, was tasked with publishing a report on the causes of the Colombia internal conflict and the emergence of armed groups. DDR: Disarmament, Demobilization, and Reintegration. FARC, or FARC-EP: Las Fuerzas Armadas Revolucionarias de Colombia Ejército del Pueblo (Revolutionary Armed Forces of Colombia Army of the People) is Colombia's main left-wing insurgent group. A Marxist-Leninist revolutionary guerrilla, the FARC opposes Colombia's central government advocating agrarianism and anti-imperialism, and has been involved in the ongoing armed conflict since the group's foundation in 1964. ELN: The Ejército de Liberación Nacional (National Liberation Army) is Colombia's less known remaining left-wing guerrilla. The ELN's Communist political platform is a combination of Marxism and Liberation Theology. Also established in 1964, the ELN as an organization is an outgrowth of university unrest, founded by Colombian rebels trained in Communist Cuba, and later by a series of Catholic priests, advocates of Liberation Theology. ICC: The International Criminal Court, which sits in the Hague in the Netherlands, is an international tribunal with jurisdiction over the international crimes of genocide, crimes against humanity, and war crimes. Its jurisdiction is governed by the Rome Statute. Colombia, which has ratified the Rome Statute, accepts the jurisdiction of the ICC over crimes against humanity and genocide from 2002 onwards and over crimes of war from 2009 onwards. 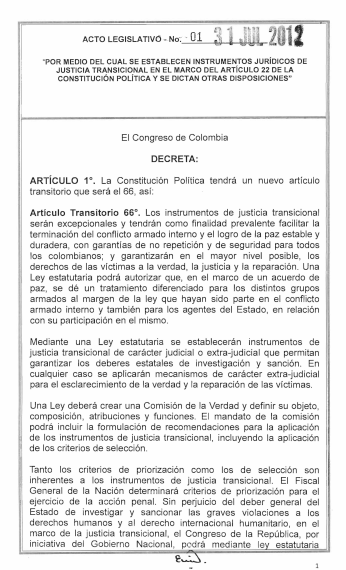 JPL: Ley de Justicia y Paz (Justice and Peace Law) was Colombia's first transitional justice instrument, passed in 2005 under the Uribe regime. M-19 Movimiento 19 de Abril (April 19th Movement) was a Colombian guerilla movement. It was the second largest guerilla group in Columbia by mid-1985, but was demobilized in the late 1980s. After its demobilization, it formed the political party M-19 Democratic Alliance, or AD/M-19. VL: The Victims and Land Restitution Law is Colombia's first well-known transitional justice instrument in Colombia that revolves entirely around victims' rights to reparation. It has been in forced since 2012.
it is important to broaden democracy as a condition to build solid foundations for peace. 1. To initiate direct and uninterrupted talks about the points of the agenda established here thatare aimed at reaching a Final Agreement for the termination of the conflict that will contribute to the construction of stable and lasting peace. 2. To establish a Table of Talks that will be opened publicly in Oslo, Norway, within the first two weeks of October 2012 and whose main seat will be Havana, Cuba. Meetings can take place in other countries. 3. To guarantee the effectiveness of the process and conclude the work on the points of the agenda expeditiously and in the shortest time possible, in order to fulfill the expectations of society for a prompt agreement. In any case, the duration will be subject to periodic evaluations of progress. 4. To develop the talks with the support of the governments of Cuba and Norway as guarantors and the governments of Venezuela and Chile as accompaniers. In accordance with the needs of the process and subject to common agreement, others may be invited. Integrated agricultural development is crucial to boost regional integration and the equitable social and economic development of the country. 1. Access and use of land. Wastelands/unproductive land. Formalisation of property. Agricultural frontier and protection of reservation zones. 2. Development programs with territorial focus. 3. Infrastructure and land improvement. 4. Social development: health, education, housing, eradication of poverty. 5. Stimulus for agricultural production and for solidarity economy and cooperatives. Technical assistance. Subsidies. Credit. Generation of income. Marketing. Formalisation of employment. 1. Rights and guarantees for exercising political opposition in general and for the new movements that emerge after signature of the Final Agreement. Media access. 2. Democratic mechanisms for citizen participation, including direct participation, on different levels and on diverse issues. 3. Effective measures to promote greater participation of all sectors in national, regional and local politics, including the most vulnerable population, under conditions of equality and with security guarantees. 1. Bilateral and definitive ceasefire and end of hostilities. 2. Handover of weapons. Reintegration of FARC-EP into civilian life, economically, socially and politically, in accordance with their interests. 3. The National Government will coordinate revising the situation of persons detained, charged or convicted for belonging to or collaborating with FARC-EP. 4. In parallel, the National Government will intensify the combat to finish off criminal organisations and their support networks, including the fight against corruption and impunity, in particular against any organisation responsible for homicides and massacres or that targets human rights defenders, social movements or political movements. 5. The National Government will revise and make the reforms and institutional adjustments necessary to address the challenges of constructing peace. 7. Under the provisions of Point 5 (Victims) of this agreement, the phenomenon of paramilitarism, among others, will be clarified. The signing of the Final Agreement initiates this process, which must be carried out within a reasonable period of time agreed by the parties. 1. Illicit-crop substitution programs. Integral development plans with participation of communities in the design, execution and evaluation of substitution programs and environmental recovery of the areas affected by these crops. 2. Consumption prevention and public health programs. 3. Solution to the phenomenon of narcotics production and commercialization. 1. Human rights of the victims. The signing of the Final Agreement initiates the implementation of all of the agreed points. System of implementation, giving special importance to the regions. These mechanisms will have the capacity and power of execution and will be composed of representatives of the parties and society, depending on the case. 4. Tools for dissemination and communication. 5. Mechanism for ratification of the agreements. Signed on 26 August 2012, in Havana, Cuba.